Buddy's Place Order your Stone Today! In September 2014 we began construction on a remodeled area off the green that has unusual azaleas from the Weston Nursery. We began construction on a new boardwalk area after our other walkways were complete. Once construction was completed, we named it Buddy's Walkway. And within this walkway, there's Buddy's Place. The walkway is for everyone, both our two legged and four legged friends. There will be interconnecting boardwalks, plantings, benches, sun dial, and Engraved Pet Stones for our favorite pets who have passed over the "rainbow bridge" as many call it. Pets are a big part of our lives and when you visit, you'll see dogs enjoying the trails. The foundation for the first section of boards is in place. You'll also see Buddy's Dog House, and the fenced in area for the pet stones. 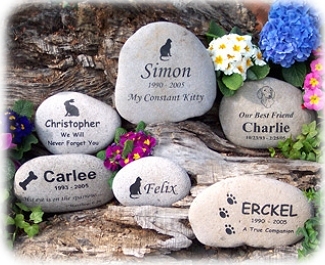 We have a relationship with an Internet Provider to purchase pet memorial stones, for uniformity sake, we can only offer donors one option: a 6-8" natural river rock engraved with an image their animal (they offer ~350 images) and two lines of text. The size and color of the stone is random and chosen by the Internet Provider. See the picture above to see samples of their work and help you fill out the form. 1) Click the Order form, PRINT, then close page. 3) Decide the graphic. There are ~ 350 images to choose from. (Jot down the exact name of your choice.) Then close page. View the graphics that are organized by kinds of pets. 5) Write in your choices on your printed form. 6) Complete the rest of the form, enclose the form, your check and mail. A donation of $100 includes the $55 cost of the stone and shipping and a $45 donation to AKP. The Woodland Walkway and the Water Garden boardwalks are now complete! Buddy's Walkway is the newest boardwalk system open to "all comers." It and will hold 350 boards roughly configured in a diamond shape. There's a sundial, a bench and woodland plantings. Buddy's will also hold pet memorial stones in a separate roped off area. All donations will be used for the betterment of the Park. The young man we use to engrave the boards (and benches, and he made Liam's train) is an Ostervillian, who now lives in Maine. That's right Maine. We collect orders for boards and electronically transmit the order when we have 10 applications. He makes them up and drives them to us, saving us nearly half the cost of the donation. He also visits family here in town. So there is always a delay between you ordering a board and the time it arrives here and it's installed. Therefore, telling you when it will be installed is nearly impossible. Some months we get a several board orders, other times none at all! So if you must have a board in by a specific date, please allow a few months prior to that so we don't disappoint you. That way you are covered! By the way, we will place orders in the winter too and then install them as soon as the ground is workable. While you walk around the park you will see benches placed in quiet places, for instance, there are several overlooking the John Folk Water Garden and there’s two under the tall trees in the Holly Dell. A bench is a wonderful way to remember a loved one or celebrate a happy memory. The siting of the bench and the wording on the mahogany bench take time and forethought and discussion with representatives from the Park. The bench will be constructed in Maine by an Ostervillian who has great affection for the Park. He drives the bench down and it will be placed by our volunteers at the site of your choosing after a $1,000 donation is received. All this takes time, so if must have the bench installed for a specific date, plan well in advance to insure its in place. Please contact the President of the Cape Cod Horticultural Society, to start the conversation. Deirdre Dow-Chase can be reached at 508-617-653-6718 or armstrongkelleypark@yahoo.com. Please leave your contact information so he can arrange a meeting with you. Whether the pilot of your flight of imagination is Peter Pan or Harry Potter, whether your power plant is Robert Louis Stevenson or Robert Frost, join us on a flight of fancy. Awaken your memories and the mind of a child by selecting a poem or piece of artwork and have it installed along the Garden of Verses. We can accept any piece of work provided it measures no more than 8.5 by 11 inches. The Garden of Verses is located along the rope line walkway in Phase III of the Woodland Walkway. The walkway ambles through a shade garden of indigenous plants. It rises to a wheel chair and stroller accessible deck featuring a train engine sculpted from cedar. The engine and a sculptured teddy bear are reminders of a two-year old whose laughter and joy were tied to a train engine. The O’Neil family sponsored the train. Liam’s train and teddy are for all to enjoy. The boardwalk artist, Mr. Reed Hayden, captured the essence of his youth and laughter. Liam’s Train, was dedicated on Saturday, May 14, 2005. For a $300 donation to the Cape Cod Horticultural Society (CCHS) you’ll provide joy to little ones as you recall poems from your own past.